My Canadian TV affection is pretty well-documented, and this morning, Netflix dropped The Order, a fun supernatural-themed series that’s wall-to-wall with some of my favorite #cdntv people and a host of familiar faces. 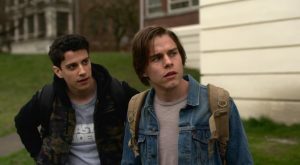 The ten-episode first season centers around Jack (iZombie‘s Jake Manley), an incoming freshman at the tony Belgrave University. His hell-bent desire to attend has nothing to do with the academics and everything to do with avenging his mother’s death. Whether that’s his laser focus or his grandfather’s is a bit of a toss-up. The key to that vengeance is a mystical skull-and-crossbones type secret society that nobody will cop to as real, but Jake is sure exists and is determined to pledge. We see separately that it is a real thing and one of its powerful members wants him in, too, but the lengths to which she’ll go to make that happen are a little murky. Throw in a a meet-cute between Jack and Alyssa (Legends of Tomorrow‘s Sarah Grey), a fellow student who he suspects knows more than she’s telling, a one-percenter segment of the student body that’s already made up its mind about Jack, and a werewolf on a killing spree, and you’ve got a mad scientist’s mix of goings on. The vibe is decidedly wink nod for us—think Fright Night—but Jack is grounded enough in his reality to try to roll with all (and there are A LOT) of the punches. I watched the first three in a row this morning (which y’all know I rarely ever do) and it was a ball. Manley and Grey are well-matched playing two people with very different agendas who realize they might need to nudge those agendas to accommodate each other. 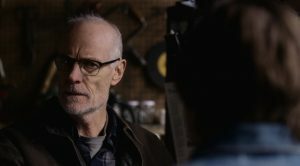 Matt Frewer is Jack’s grandpa, Pops, and he’s terrific here as an embittered, grieving father who is still pretty damn funny and practical, regardless of the fantastic things Jack sees and reports back. 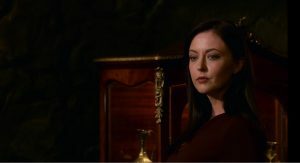 Inside the society, the always-delicious Katharine Isabelle (who has mega werewolf cred from the cult hit Ginger Snaps and is currently on the Canadian series, Little Dog) is the chair of the college and the top of the local food chain in the society. 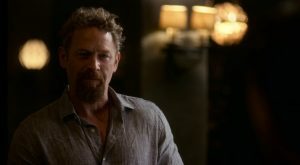 She bristles a bit at the oversight of its national leader, Edward Covington (Max Martini, having WAY too much fun). 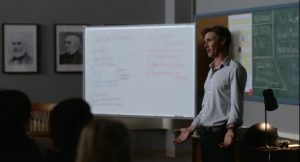 True Blood‘s Sam Trammell is Jack’s ethics professor, to whom he hilariously posits rather existential, “If…then,” quandaries. Thomas Elms (Aurora Teagarden). Also look for Hallmark familiar faces–Hailey Dean Mysteries‘ Emily Holmes and Father Christmas trilogy’s Julia Benson in very funny turns as one of the helicopter parents and Jack’s English prof. 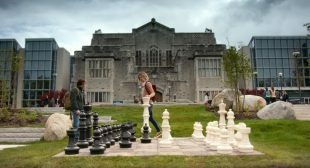 The series was created by Motive‘s Dennis Heaton, who we last saw working on Syfy’s Ghost Wars. Here he’s exec producing with Shelley Eriksen (Private Eyes) and has assembled several of his colleagues from both shows — writer/producers Rachel Langer and Jennica Harper, directors Leslie Hope, Kristin Lehman, David Von Ancken, Rachel Leiterman, and Mathias Herndl and new collaborators in writers Jason Filiatrault and Penny Gummerson. This morning, I jumped on the phone with Heaton to chat about the show. In this first installment, we talk about where the idea came from, and how he arced out the first season. Heaton says his childhood movies and a sweet tradition with his dad directly led to his love of horror, and genre in general. “I’ve always loved horror, from the time I was a kid. My dad would come home from the late shift and it’d be midnight and we’d watch Night of the Living Dead or whatever crazy horror movie was on that night,” he recalls. 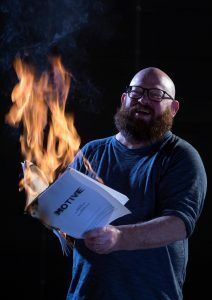 The series marks the first time Heaton has done a project specifically for streaming, and potentially a binge watch, and it informed how he approached developing the season. “That gave us a lot of latitude to play with the editing. If we tweak something in episode seven, we can go back to [another episode] to add a line so something tracks. That’s just an example, that’s not a clue,” he laughs. The Order is available everywhere now on Netflix. Here’s a sneak peek. And check back next week for part two of our chat where Heaton talks about assembling his creative team and cast for the first season. 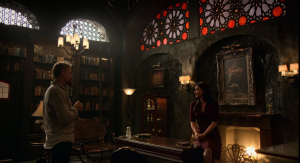 I enjoyed watching The Order until the last three minutes of the final episode. Apparently, I’m not the only one who feels disappointed as Twitter is loaded with “liked the show/hated the ending” comments. If you have another opportunity to interview Heaton, please ask him about the thinking going into that ending. I would imagine it was “to make people want a second season.” He’s on Twitter and Insta if you want to ask him directly. Personally, I was OK with the ending because [no spoilers] we know *it* is reversible, but I totally get and appreciate that some fans are disappointed.